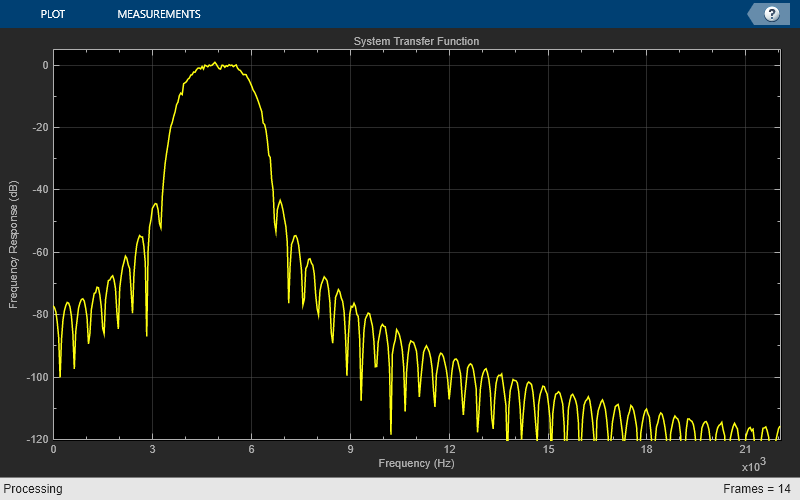 The dsp.VariableBandwidthFIRFilter object filters each channel of the input using FIR filter implementations. It does so while having the capability of tuning the bandwidth. Create the dsp.VariableBandwidthFIRFilter object and set its properties. vbw = dsp.VariableBandwidthFIRFilter returns a System object™, vbw, which independently filters each channel of the input over successive calls to the object. The filter’s cutoff frequency may be tuned during the filtering operation. The variable bandwidth FIR filter is designed using the window method. vbw = dsp.VariableBandwidthFIRFilter(Name,Value) returns a variable bandwidth FIR filter System object, vbw, with each property set to the specified value. You can specify additional name-value pair arguments in any order as (Name1,Value1,...,NameN,ValueN). Input sample rate, specified as a positive scalar in Hz. This property is non-tunable. Specify the type of the filter as one of 'Lowpass' | 'Highpass' | 'Bandpass' | 'Bandstop'. This property is non-tunable. Specify the order of the FIR filter as a positive integer scalar. This property is non-tunable. Specify the window function used to design the FIR filter as one of 'Hann' | 'Hamming' | 'Chebyshev' | 'Kaiser'. This property is non-tunable. Specify the Kaiser window parameter as a real scalar. This property is non-tunable. This property applies when you set the 'Window' property to 'Kaiser'. Specify the filter cutoff frequency in Hz as a real, positive scalar, smaller than the SampleRate/2. This property applies if you set the FilterType property to 'Lowpass' or 'Highpass'. Specify the filter center frequency in Hz as a real, positive scalar, smaller than SampleRate/2. This property applies when you set the FilterType property to 'Bandpass' or 'Bandstop'. Specify the filter bandwidth in Hertz as a real, positive scalar, smaller than SampleRate/2. This property applies if you set the FilterType property to 'Bandpass' or 'Bandstop'. Specify the Chebyshev window attenuation as a real, positive scalar in decibels (dB). This property is non-tunable. This property applies if you set the Window property to 'Chebyshev'. y = vbw(x) filters the input signal x using the variable bandwidth FIR filter to produce the output y. The variable bandwidth FIR filter object operates on each channel, which means the object filters every column of the input signal independently over successive calls to the algorithm. This example shows you how to tune the center frequency and the bandwidth of the FIR filter. All transformations assume a lowpass filter of length 2N+1. There is no need to recompute the window every time you tune the cutoff frequency. We can transform a lowpass filter to a bandstop filter by combining the highpass and bandpass transformations. That is, first make the filter bandpass by shifting the lowpass response, and then invert in to get a bandstop response centered at ω0. The transformations highlighted above can be combined to transform a lowpass filter to a lowpass, highpass, bandpass or bandstop filter with arbitrary cutoffs. For example, to transform a lowpass filter with cutoff ωc1 to a highpass with cutoff ωc2, you first apply the lowpass-to-lowpass transformation to get a lowpass filter with cutoff ωc2, and then apply the lowpass-to-highpass transformation to get the highpass with cutoff ωc2. To get a bandpass filter with center frequency ω0 and bandwidth β, we first apply the lowpass-to-lowpass transformation to go from a lowpass with cutoff ωc to a lowpass with cutoff β/2, and then apply the lowpass-to-bandpass transformation to get the desired bandpass filter. The same approach can be applied to a bandstop filter. Jarske, P.,Y. Neuvo, and S. K. Mitra, "A simple approach to the design of linear phase FIR digital filters with variable characteristics." Signal Processing. Vol. 14, Issue 4, June 1988, pp. 313-326.